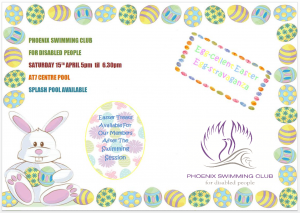 also very willing to have accompanied swimmers for the 25m freestyle. The Peaks LC/ Snowdome is a great place for a family outing, which members may wish to consider. Gala participants get free parking. Bedworth Saturday 18 November. 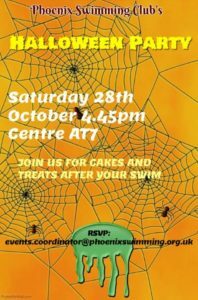 Bedworth Disabled swimming club would appreciate us fielding a 25m relay team of 4 swimmers, may have to include both male & female. 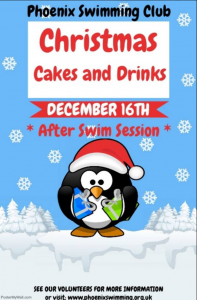 Can we please circulate this information to members & consider which swimmers may wish to participate. If you are interested in either or both of these events please speak to Sheena. It will be great if we can get as many members to attend this as possible. I hope to see everyone there. So that people can plan please be aware that The Club AGM is on Saturday 3rd June 2017 at Centre AT7. Time to be confirmed. It will be great if we can get as many members to attend this as possible. 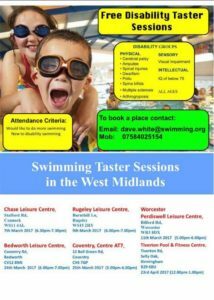 ASA holding Disability Swimming Taster session at the AT7 on 25/03/2017. Festive Party Raffle Funds Raised. Thank you to everyone who supported the party and generously bought raffle tickets to win our array of prizes. The money raised will be ploughed back into the club to help finance up and coming future events. Watch this space. Kidz to Adultz – 16th March 2017 – Ricoh Arena, Coventry. 2017 Club Membership Form Available here for download. 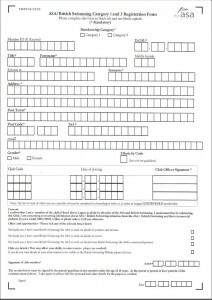 Here is the Club Membership form 2017. Please bring it to the next session with you.